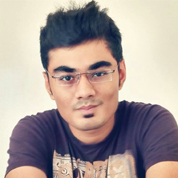 Aakash Shah spearheaded All India Bakchod's Social Media Channels and created, among other things, India's largest single's movement - Pyaar Ek Dhoka Hai. The movement got singles from across India and abroad to collectively celebrate self-love. Aakash was also behind the hilarious and immensely popular facebook account "Unofficial : Bombay High Court" that got shut down last year after numerous cases were filed against the page at Hon'ble Bombay High Court. Him and the team have been behind many internet trends in the Indian landscape we have all seen in recent past.